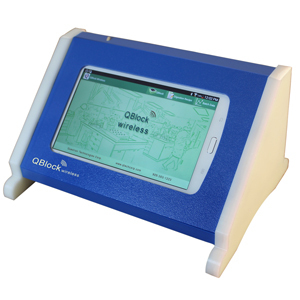 The QBlock Wireless Controller is the only device capable of wirelessly controlling up to 8 QBlocks digestion blocks. Can even control competitive brand digestion blocks. The QBlock Wireless Digestion System comprises of one Controller, up to eight QBlocks accompanied by an Electronics Interface box. This system provides unparalleled value and ease of operation in performing multi-step, variable temperature profile block digestions. The Wireless Controller searches for active QBlocks and loads recipe program data, initiates a new digestion batch and downloads the digestion data residing on the Electronic Interface. It is the same as having up to eight independent block digestion systems, all performing their own, independent digestions. Each QBlock is connected to an Electronics Interface box via a power cable and temperature measuring sensor. The Electronics Interface box can maintain the commanded temperature profile and store the heating profile data independently, even in the absence of the Controller.